In a small bowl combine light soy sauce, black soy sauce, Golden Mountain sauce & sugar. Set aside. In a large pot of boiling water, add salt to taste(optional), 1 tbsp oil & noodles. Cook noodles until tender but still firm to bite, stirring frequently. Drain. Keep all your ingredients prepped & ready before you start. In a large wok, heat 1 tbsp of oil over medium heat. Swirl the wok (carefully) to coat the bottom & sides of the wok with oil. Add garlic & chillies & saute for 30 seconds. Raise the heat to high & add green onion, bell peppers & baby corn & saute for about 2 minutes. Add noodles & sauces and toss to combine until sauces are absorbed. Adjust seasoning as per your taste. Turn off the heat and add the holy basil. Toss to mix with the noodles. Serve. Light soy sauce is NOT the same as Low-Sodium Soy Sauce. All the above sauces are essential to get the right flavors of this dish so do not skip these sauces. These sauces are available in Asian Grocery stores. You can add veggies (broccoli, cabbage, carrots etc. ), tofu, meats of your choice. 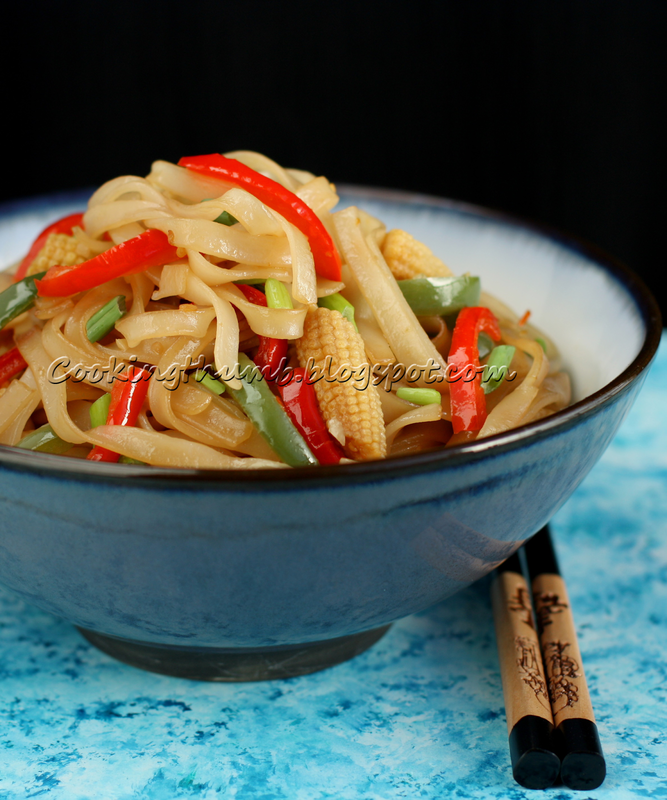 I used dry Rice noodles, you can use fresh noodles if you so prefer. If using fresh noodles, cook the noodles as per the instructions given on the package.